There’s a line spoken in Rian Johnson’s film Looper in which Jeff Daniels comments on how stories rarely ever want to do anything differently. It was intended as a direct reference to the way in which films today are made, usually adhering to a certain style or archetype and rarely wanting to interfere with the way in which audiences connect and engage with the movies they pay to see. Now Rian Johnson has placed his artist’s hand upon the Star Wars galaxy, employing very much the same method that made Looper such an innovative achievement. And while that method is very much noticeable, it doesn’t always work to the film’s benefit. 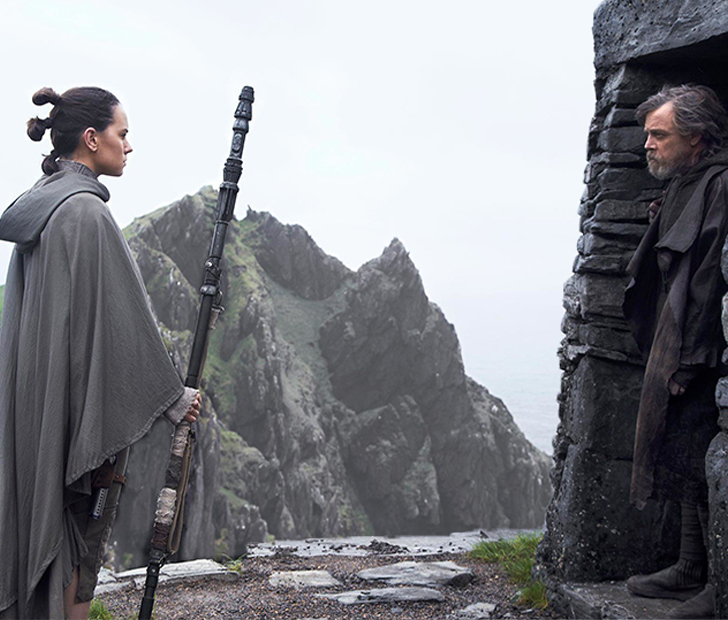 The characterization of Luke in this film is a double-edged sword — on the one hand, it’s unsettling to see such a virtuous character who we love fall from grace and give in to such despair, and yet from a narrative viewpoint it’s an unconventional move that feels all too real-world. We loathe seeing our mentors and heroes portrayed in a negative light, and yet it’s an occurrence that still does happen all too often. For the truly staunch Star Wars aficionado who’s always dreamed of seeing Luke become the wise master we all assumed he’d become, this film will disappoint. Without going into much detail, it’s a character arc that is excellent in concept and yet isn’t given the proper room to breathe and manifest itself properly. Of course, it’s Carrie Fisher who many are most curious about in this film. Again, without revealing too much, it’s really the performance of her career. 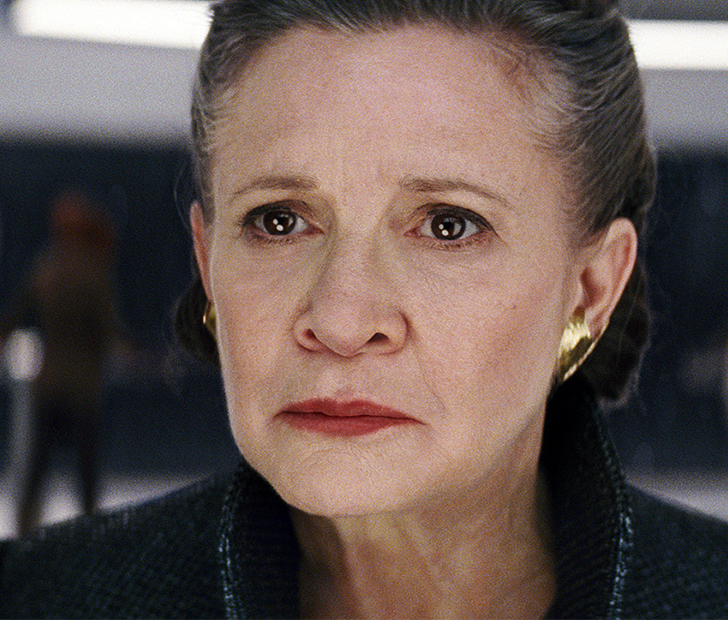 Fisher balances that “strong feminine presence” with the woes that her character experiences, providing so many lovely moments in which we’re given a brief look at the weight that falls on Leia’s shoulders. It’s a final performance that she would be proud of. Though not every character is utilized properly, all other performances are provided to the best of the actors’ abilities. Poe, despite being portrayed a bit too harshly as a hot head pilot, still bears the same humor that he had in The Force Awakens and, most importantly, grows as a character. Finn is given a side mission with newcomer Rose Tico that, while important to the plot, meanders perhaps a bit too long than it should have. But it’s really Rey and Kylo Ren who drive this plot forward in a large way. It’s their relationship through the Force that creates a compelling storyline weaved into the narrative. It’s the kind of thing that very easily could have failed but ultimately ended up being one of the most effective components of the film. Both Daisy Ridley and Adam Driver have grown with their characters and incorporate that advanced maturity to make Rey and Kylo the thing that you can’t wait to see what happens next. Of course, The Last Jedi hits all the mandatory beats — space battles, some lightsaber action, adorable creatures (which are flat out hilarious and don’t at all detract from the film), bizarre aliens, a direct recreation of the classic Mos Eisley cantina scene, and plenty of talk about the Force. While you occasionally get the feeling that Rian Johnson is ticking off boxes on the Star Wars to-do list, it’s (mostly) done in a reverential way to what’s come before it. Also, there are some really excellent nods to the original films (and even one to the prequels) that feel very satisfying and appropriate. Click on the next page to finish the review!